hyperpanther, watchgeek216, fskywalker and 2 others like this. Drksaint, watchgeek216, fskywalker and 2 others like this. Thats a nice watch. Im clueless about serial numbers and dates. Personally I dont bother with things like that as they often change the way they are identified anyway. I know Rolex switched their numbering system at one point, probably for the very reason youre asking. If its got a receipt for 1995, it doesnt matter if it was made in 1993 as it was guaranteed from when you (or the original buyer in this case) bought it. Its certainly not a mid 80s model. Someone else might chime in with serial no info. When you say recently serviced, do you mean a few months ago? assuming it was an Omega or omega authorised centre you wont need to worry about it. Those things are bomb proof. My partner is a watch wrecker, she doesnt care about watches and uses them as beaters. Ive seen her bash her omega so many times it makes me shudder. She swims with it too and had hers for 8 years before putting it in for a service although I wouldnt advise leaving it that long. Its just testament to how much those watches can handle. They really are brilliant. Youve got nice patina going on there too by the look of it. Enjoy your new watch in good health. I've also found that the bezel is HARD to turn. I've read that the scalloped edges are harder to turn, but it's also super tight. Anyone else experience this? Is it worth having it looked at? Ill probably just live with it as. I rarely use a bezel. But thought us ask. Congrats on your beautiful blue Seamaster! The bezel friction you describe sounds normal. It is a bi-directional bezel...meaning it spins both ways. Omega makes it tougher to turn in case you bump into something. The last thing you need is running out of oxygen while timing a dive because you nudged the bezel by accident. It’s actually quite dangerous which is why many dive watches feature a unidirectional bezel. Anyway, wear it in good health! You should be able to swim with it on, it is a diving watch. You mentioned it was serviced recently, but it would not hurt to have the gaskets checked to make sure the watch is still waterproof. 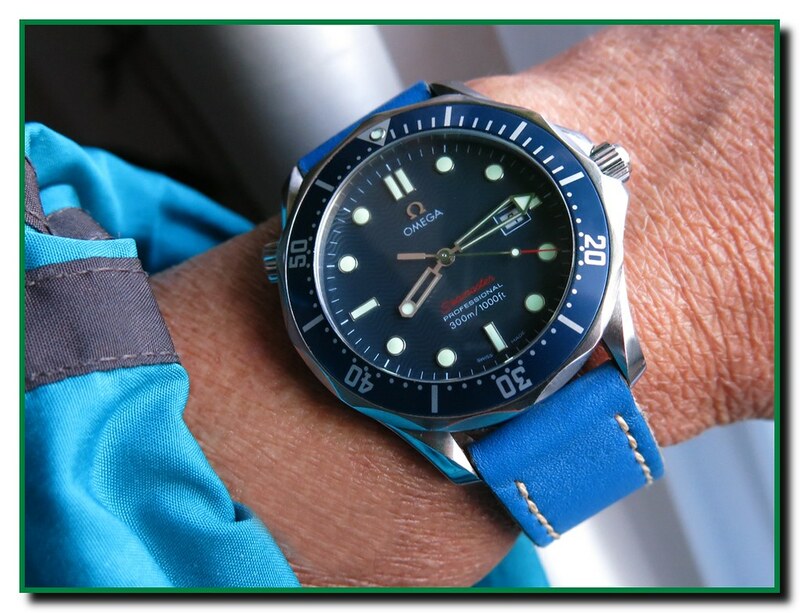 Enjoy your Seamaster, from the photos you can see it is in excellent condition. No way about the serial #. This Bond model came out in 1995 with the movie in which Pierce Brosnan wears a quartz version of it. I had the auto model like yours but gifted it to my nephew. Then bought the updated quartz version and still have it in the collection. Will it still be water resistant? Likely but you can always have the watch tested if you are paranoid haha! Tis a classic Omega diver! First congrats on the Seamaster. 49 million probably means it is a caliber 1109 (pre cursor of caliber 1120). A watch can be years without being sold so a difference on serial number approximate year and sale date is not necessarly an issue. The bezel should only rotate to one side (counter clockwise) as it is a diving bezel; GMT’s are the ones tipically have a bezel that turns both ways. Last edited by fskywalker; 22 Hours Ago at 14:32. Since this is a new old watch, I’d recommend bringing it to your watchmaker or jeweler and have them pressure test the watch to make sure it’s hermetically tight before swimming with it. It should cost you $25 or so (depending on where you take it). I pressure tested a Seiko Quartz Diver (7548) I picked and ended up needing to replace the backcase gasket. Now I swim with it with no problems. It is better to be safe than sorry in this case since if any moisture gets into the guts of your watch it will cost big $$$ to repair. Also - With a difficult turning bezel it COULD be that there is some dirt/dust/debris on the bottom side of the bezel. You can either use a bench knife to pop off the bezel yourself and clean it or bring it in to a trusted watchmaker or jeweler. Attached is a pic of my Seiko 7548 (circa ‘84) which needed a little love from my watchmaker to bring it back to manufacturer’s operating spec. Last edited by kidk007; 1 Day Ago at 07:57.